Body cavity contains internal body contents enclosed in membranes. 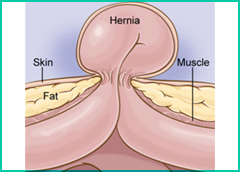 Hernia is caused when the body content tears through the membrane and protrudes out. Hernias are Asymptomatic and do not produce any symptom that can help in their diagnosis. But, it can cause mild to severe pain in cases when they are under continued stress or in contact with other body parts. Pressure over body content either for a moment or continuous, when coupled with a weak opening caused due to weakness of muscles or fascia, results in hernia. Hernia Surgery focuses on reducing the pressure over the body content, relieve the pain and put back the protruding body content back with the membrane. It is followed by covering and strengthening the weak opening minimizing the chances of re-occurrence. Cost of Hernia Surgery ? Type of hernia, the location of hernia, your age, other related complications and your health conditions along with various other factors are required for proper assessment of Cost of hernia surgery.